Ghosn unveils the Infiniti Q60 in Detroit. The coupe keeps the distinctive lines and sharp angles of the concept that debuted at last year's Detroit show. DETROIT -- Infiniti's Q60 sport coupe shares the more sophisticated underpinnings of the Q50 sedan, marking the end of the old-generation G-series models that once supplied a large portion of Infiniti sales. The outgoing Q60 was a renamed G37 coupe. The Q60 coupe will go on sale by mid-year as a rival to cars such as the BMW 4 series and Audi A5. Though coupe sales are usually lower than those of the sedan, Parker says the Q60 will fill a void in Infiniti’s portfolio by adding a sport-coupe option to customers attracted to the Q50 -- the brand’s volume leader. Introducing the car at the Detroit auto show, Nissan CEO Carlos Ghosn said the coupe will offer three engine options for the first time -- a 2.0-liter turbo, four-cylinder and a 3.0-liter twin-turbo V-6 configured to deliver either 300 or 400 hp. 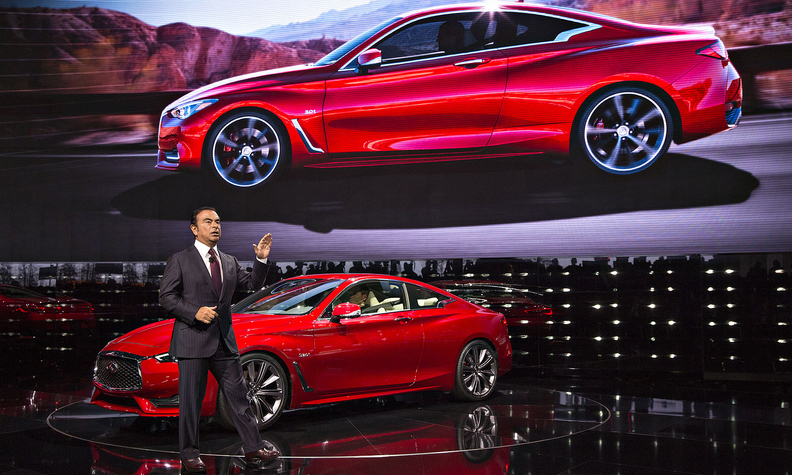 Ghosn said the coupe would help Infiniti move past its 2015 global sales record, when it sold 215,250 vehicles. That volume includes 133,498 sales in the U.S., an increase of 14 percent from 2014 and an all-time high of 7,000 vehicles in Western Europe, a rise of 45 percent. The production Q60 is almost the same as the concept version of the car unveiled at the 2014 Detroit show. The body features a deep belt-line crease, chrome vents behind the front wheels and a more pronounced front grille. As an option, the car receives Infiniti’s new dynamic digital suspension, which provides improved ride comfort in sporty driving. The coupe also receives the second generation of Infiniti’s direct adaptive steering. First introduced on the Q50 sedan, the steering technology allows drivers to personalize the steering feel for different driving conditions.